Currently, sugarcane bagasse (SB) is the most abundant agricultural residue generated in Brazil. Given that hemicelluloses can reach up to 30% of SB, bioconversion of this fraction into second generation ethanol (2G) is essential for the success of biorefinery based operations. For 2G ethanol production, techniques such as immobilization process could be an interesting strategy to improve process productivity and must receive special investigation. 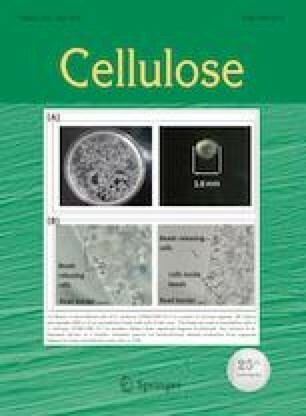 Cell immobilization of the native Brazilian pentose wild converting yeast, Scheffersomyces shehatae UFMG-HM 52.2, was proposed for the production of 2G ethanol from SB hemicellulosic hydrolysate. A 23 full experimental design was constructed with varying concentrations of sodium alginate (1.0, 1.5 and 2.0% w/v), and calcium chloride (0.1 M, 0.15 M and 0.2 M) and conditioning time (12, 18 and 24 h). Through statistical analysis, it was determined that highest ethanol yield (YP/S of 0.32 g/g) and productivity (QP of 0.146 g/L.h) were obtained with immobilization conditions of 1% sodium alginate, 0.2 M calcium chloride and 12 h of conditioning time. Repeated batches were conducted employing these defined conditions, showing the feasibility to use the system for 5 consecutive cycles. Results highlighted the use of proposed approach for ethanol production, promoting its inclusion in biorefinery operation portfolios. 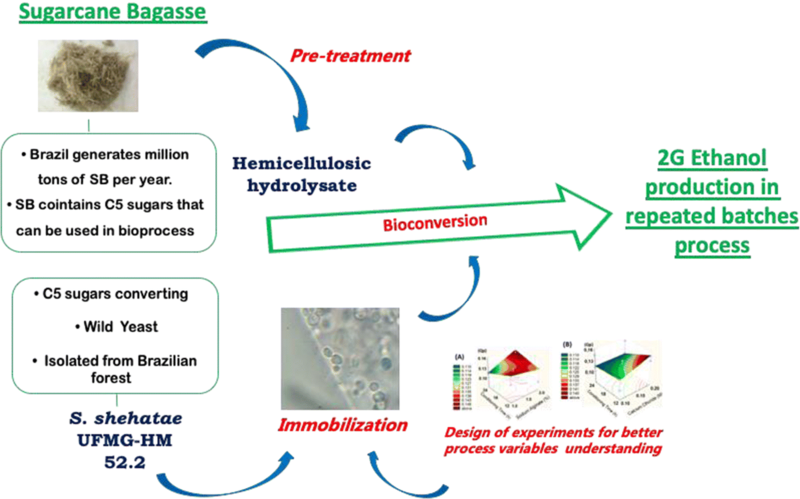 Hemicellulosic hydrolysate from sugarcane bagasse: a large available carbon source; S. shehatae UFMG-HM 52.2 is a Brazilian wild native pentose fermenting yeast; Immobilization conditions for this yeast were defined for ethanol production; Stability in ethanol production was demonstrated in 5 repeated consecutive batches; Our approach was demonstrated feasible for industrial 2G ethanol process development. Authors would like to thank Conselho Nacional de Desenvolvimento Científico e Tecnológico—Processo CNPq [154193/2018-6], FAPESP (Fundação de Amparo à Pesquisa do Estado de São Paulo) (2014/27055-2), CAPES (Coordenação de Aperfeiçoamento de Pessoal de Nível Superior), and FAPESP-BIOEN. AKC is thankful to USP-CAPES visiting researcher program. Authors also thank Prof. Carlos A. Rosa, who kindly provided the yeast S. shehatae UFMG-HM 52.2 from the culture collection of Federal University of Minas Gerais- MG- BRAZIL.